(Newser) – Amazon held a massive nationwide job fair Wednesday, which is a good thing since retail companies are blaming the internet giant for forcing them to close thousands of stores and lay off employees. On its first-ever Jobs Day, Amazon aimed to hire 50,000 workers to fill positions at 12 warehouses in a single four-hour period, NBC News reports. 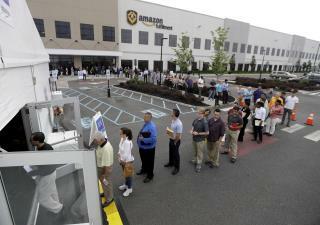 According to Fortune, thousands of hopeful applicants lined up outside Amazon warehouses in New York, Maryland, Tennessee, Ohio, Kentucky, Wisconsin, and more with the hopes of being offered a job on the spot. Some complained about the pay at their current jobs, while others touted the benefits package available to Amazon's warehouse workers. Amazon was hiring for positions that pay between $11.50 and $13.75 an hour. I can't believe Trump isn't trying to take credit for this Amazon mass hiring. Might as well hold out for one of those $15 per hour burger flipping jobs.